The draw for the Irn Bru Cup first round has been confirmed, with the Scottish Premiership colt teams returning for their second year in the competition and here at YFS we’re taking a look at the competition in greater depth, casting our eye over the exciting fixtures from the opening round. The new format for the tournament was introduced last season, with the winners of the first round also being joined in the second by clubs from Wales, Northern and the Republic of Ireland, whose sides are making their debut in the competition this season. The eye-catching tie of the round is an all-colt clash between Aberdeen and St Johnstone, who suffered second and first-round exists last year respectively. Celtic will look to impress once again as they start off with an away match against Annan Athletic, whilst Old Firm rivals Rangers face a tough challenge away to Championship side Dumbarton. Elsewhere - Motherwell, Hamilton, Partick Thistle, and Kilmarnock have all bagged home ties in the opening round in the South section of the draw, with Aberdeen, Dundee, Ross County and Hibernian likewise in the northern section. However, Hearts face a trip to Formartine United – their third consecutive away game in Irn Bru cup games having yet to draw a home tie. The introduction of colt teams was widely praised over the past year, with Celtic going the furthest as they reached the third round only to be put out in a 5-1 defeat to Livingston. It was generally a tournament to forget for many colt teams last season however, with Ross County, Inverness, Dundee, and Kilmarnock failing to get past the opening stage. The rest of the Premiership clubs, besides Celtic, fell in the second round. Whilst many of the colt sides will be looking to improve on last season, Dundee United will be looking to mount a successful title defence after the playoff defeat left them out of the Premiership for another year. Linfield and Crusaders will join from Northern Ireland this season, whilst Sligo Rovers and Bray Wanderers will enter from the Republic of Ireland. The New Saints will make their return to the competition from Wales after reaching the semi-final in an impressive showing last campaign, and they’ll be joined by Connah’s Quay Nomads. All ties are set to take place on August 15/16. The East of Scotland FA/Scottish Lowland Football League Under 20 setup is bracing itself for its biggest season yet, after a summer expansion. Joining the setup for the first time are Mid Annandale, Bonnyton Thistle and Burntisland Shipyard. Mid Annandale are an established South of Scotland League team at senior level, whereas Bonnyton are due to make their bow this year in the same competition. Burntisland Shipyard's first team play in the East of Scotland League. All three clubs have been strong performers in the SYFA ranks in recent years, with Mid Annandale sweeping the board in the D&GYFDA Under 17 age group, Bonnyton racking up a number of Scottish Cup successes and Burntisland excelling in the AFYFC. All ties will be played on, or before, Sunday 3rd September 2017. To watch the draw as it took place Click here. The last 16 of any tournament signals the start of the ‘business end’ of the competition, and the SWF Youth Cup reached that very stage at the weekend. The 13s age group had one match with a special visitor, as Motherwell FC star Louis Moult took in the Fir Park clash between Dundee United SC Girls and Motherwell Claret. The striker was treated to an extraordinary game, with Motherwell coming out on top in a goalfest. A Leigha Dobbins hat-trick saw her win Player of the Match. Elsewhere, there was a five goal thriller between Pollok United and Glenrothes Strollers, and Alex Fisher and Erica Wyse sealed victory for last season’s winners Bayside Girls FC Blacks against Musselburgh Windsor. Bedlay saw off Linlithgow Rose to reach this stage of the competition for the first time in their young club's history. Eve Traynor was the poster girl in the match between Boroughmuir Thistle Purple and Central Girls FA, popping up in extra time to send the latter into the quarters with virtually the last kick of the ball. There were also big wins for the Old Firm. Rangers faced Hibs Development and Kirsty O’Brien was a hat-trick here with Reanna Bates, Freia McDonald and Roise McQuillan also scoring twice. Celtic’s bid to retain the trophy continues strongly, as they kept a clean sheet against Raith Rovers and racked up plenty of goals at the other end. In a titanic tussle between two of women’s football giants, Hibernian scraped past Glasgow City thanks to goals from Eve McFadden and Eilidh Adams. Jessica Smith picked up the Player of the Match award. More history was made as Rutherglen Girls got the better of Stenhousemuir to reach the last eight for the first time. In the 17s, Glasgow City FC recorded a thumping win against Dunfermline Athletic Girls but perhaps the most exciting match of the round was an eight goal bonanza between Morton Girls and Montrose Youth. Morton bounced back from 3-1 down at one point to make it all square but Montrose saw off the challenge and booked a place in the quarter finals. The University of the West of Scotland's (UWS) first team finished top of the British Universities & Colleges Sport (BUCS) 3A League. They finished with 21 points closely followed by Edinburgh's 2nd team with 18 points. A very competitive league, but their can only be one winner and that was UWS. We caught up with the President of the Sports Union at UWS, Jonathan Cranstoun, to find out how they did it. The level of skill along with the improvement and dedication of the team has allowed them to overcome their opponents in the league and prove themselves to be amongst the best. Jonathan commented, "The team have developed throughout the past few years, developing a close bond with each other, which has been a key part in the success of the team. Working closely with the university and their scholarship programme has allowed the club to attract some top players to the university." Having the opportunity to bring strong players onto a university squad allows them flexibility within the line-up as they know that each and every player can come onto the pitch at any moment and show that they deserve to be on the team. Although the team finished top of the league, the season was very competitive throughout, with their closest challengers being their biggest test. Jonathan said, "The biggest match this year must have been through on the east coast on the first of March against Edinburgh 2nd team. We knew we had to win this game to secure the league and our biggest win of the year. We have had a rivalry this year with Edinburgh so it has been great to come away with the win." UWS ended the game 4-2 against Edinburgh, away from home. Being able to comfortably beat your strongest competition in the league must have been a great feeling and cemented them as the best team in the league. Last season, the squad finished first in the BUCS 4A League, and finishing top of the next division means they can only hope to continue the climb. Jonathan said this about the changes between seasons, "We haven't had much change apart from attracting new players as we have had the same main squad for a few years now, which is a key reason for our success. Next year will be a big challenge for the club as we go into Division 2 and will be losing a few of our key players so we will have to focus on recruitment during freshers." Having the option to recruit fresh faces, can help to reinvigorate and bring a keen and exciting atmosphere into the team. Picking a star player can be a hard task in such a team based sport like football and Jonathan was asked to do exactly that. He commented, "Our star player this year has to have been Scott Murray, he scored three out of our four goals during the league clinching match against Edinburgh when we were down 2-1 at half-time." Being calm and collected under pressure is the quality of a star player who can go far in football. The whole team raillied around each other and were able to pull out a victory after a half-time deficit. We hope that The University of the West of Scotland continue to find success throughout the BUCS 2A League with fresh faces and veterans of the league working together to find the victories they are after. Kept a clean sheet (in-open play at least) in the result of the week, Inverness 1-2 Dundee (Inverness pen). Calum had to face long periods of pressure and fended off a tonne a shots from overage Inverness strikers Ebbe and Boden. The 15-year-old defender had to deal with Inverness overage strikers Ebbe and Boden in Dundee’s 2-1 win, with the Inverness goal coming from the penalty spot, so an impressive clean sheet for the younster in my eyes. Another clean sheet for Ryan as Hibs beat Partick 4-0. Returned to his old club and again impressed against a Dundee United side that included a handful of first teamers. Ended 2-2 there with County grasping the title with one hand. Another young player making an impressive impact against older players in Dunfermline’s 2-1 away win v Killie at Rugby Park. Very young Dundee Midfielder facing Inverness players 5/6 years more senior and taking all 3 points. Another lively performance in his sides 2-2 draw at Dundee United. Adam with another solid performance this week as his, and his sides good form continues. 4-0 v Partick. Bagged a hat-trick in Hearts’ 3-1 away win against a good looking Aberdeen side. Scored a brace in a 3-2 win over St Mirren. Yet another hat-trick for Oli in a 4-0 win v Partick. Aberdeen University Women's Football Club won the Scottish Student Sports Cup in thrilling fashion, narrowly beating out Stirling Women's to a 3-1 victory. We caught up with Emily Gallacher the captain, to find out how they did it. Beating out all other women's university teams is a huge accomplishment and something that the team can be extremely proud of. Emily said, "We are amazingly proud of our accomplishments, this has been a reward for all our hard work and dedication throughout the season. Looking around the pitch after the final whistle blew, we were ecstatic, the 7am starts and 11pm finishes had paid off." It sounds like the training, dedication and commitment has all came together to produce a cup winning team. Although they had a great game, the team faced challenges throughout the game and had to push themselves to make sure they came out on top to lift the cup. Emily commented, "Our biggest challenge of the day was just keeping our heads and remaining focused. After experience with losing leads in the final minutes of games before, we knew we couldn't let it happen again, and we reacted in the best way possible." Emily and her team lost a goal with 15 minutes to go before full time and this made them fight harder and they responded brilliantly. The teams success in the Conference Cup has not been a fluke. Aberdeen Womens Team have done better this season in the league than any previous seasons and the motivation and drive to succeed is what pushes them. Emily said, "We've upped our training this year and re-structured our sessions so we can focus on specific tactical aspects of the game seperately from the rest of our squad. This year we've had the most members join AUWFC, and although many of them are beginners, their love for the game and desire to improve spurs us all on." It seems like AUWFC have a winning attitude and look forward to any competition where they can prove themselves. Although AUWFC played strong together as a team, Emily was given the hard task of choosing 1 player that stood out above the rest. Emily commented "Caitlin Read ran constantly throughout the match. Playing up front alone against a solid Stirling back 4 is no easy task but she showed desire to win the ball back and press their defence when they had the ball." Having a passionate and dedicated player helps to bring the team together and motivate the others to push and work hard. AUWFC have made a strong impression after winning this cup and are looking to continue their growth and remain as a club that welcome new, enthusiastic players. Emily commented, "We are looking to continue our growth and uphold our reputation as a team that continues to support beginners and create talented footballers. Over the years we've seen a fantastic increase in numbers and supporters which is a credit to the womens game all over the world." Women's football has seen an incredible growth worldwide recently and to see a University team feel the effects of this also is a great thing to see and we hope that support and willing players continue to grow. The full match DVD from Aberdeen's cup final triumph can be purchased by clicking here. 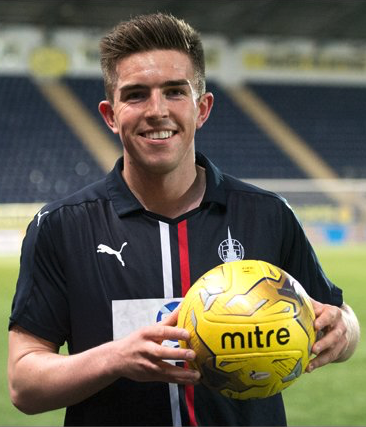 Hat-trick hero for the Bairns in a 3-0 win v Dundee. Nice to see Kevin’s hard work for club and country pay off at this level. A player with a real eye for goal and blistering pace. Keeps his place in TOTW again this week for a superb solo effort in a 2-1 win v Celtic on Tuesday. A win that sees his side leapfrog Hamilton into 2nd, well and truly back in the race for the title with 3 games left. Had to slot Calvin in this week for last Friday’s 3-0 win v Hibs. Big game that one for both sides, Calvin popped up with 2 goals and an assist in a comfortable 3-0 win. Unfortunately the reverse fixture on Tuesday didn’t go his way. Davie is on the fringes of the Motherwell first team, I don’t think any first team goalie in Scotland could’ve stopped his second, hats off to you Davie. Mark’s calming playing style in midfield was central to an impressive 3-1 away win versus a strong looking Inverness side. Grabbed an assist in the process. Keeps his spot after playing a key role in his sides 2-1 win in a top of the table clash with Celtic. Made the scoresheet for the second week running. Second goal in as many weeks for Ali. Last week it was against an older and more experienced Dundee United side, this week it was Accies away who were on the receiving end, ended 2-2. Despite a shakey Partick start and conceding early on, they settled down well and handled the attacking overage Inverness players in style, McMullin was vital. They went onto win 3-1. An attacking full-back who was rewarded with an assist and a clean sheet in a solid Falkirk 3-0 win. Yet another attacking Bairns full-back Tony, on the left flank was equally as impressive as team-mate Finlayson. Tony also claimed an assist and the well earned clean sheet. The young Saints custodian saved a penalty and weathered the Accies onslaught to earn an unlikely point away at in form Hamilton. Also extra credit for facing an overage Hamilton front line. Top plays second in what is, undoubtedly, the biggest game of the season so far. With the home side taking a 4-point lead into the game over Hibs, you sense a County win would leave them with one hand firmly on the trophy. Banks O’Dee Albion Under 17s made it into the Scottish Cup final for the 2nd year running after a 3-1 win over Giffnock Thistle at Crombie Park, Culter. Connor Wood and a Greg Pirie brace was enough for the Aberdeen outfit to make it into the showpiece event on the 14th May at the Excelsior Stadium where they will take on Syngenta Juveniles. Albion 2000s has won every local domestic trophy since their inauguration into the competitive leagues and are already into the final of the Raymond Kelly Association Trophy and in the semi-finals of the Noskab Trophy. Banks O’Dee Albion coach Patrick Ritchie shared his thoughts on the game when he said: “As Bruce McGregor mentioned, nobody ever remembers the quality of a semi-final you just remember the result and I think that was very much the case. It was a typical semi-final and wasn’t a great game but the result was the most important thing. “I think it was a deserved victory, I don’t think Giffnock would have any complaints about the result as we were in control of the game however to be fair they came back into the game as they brought the game back to 2-1 before having a player sent off. “The great thing is that we won’t be distracted by the game on May 14th as there is so much to play for in the ADJFA. Obviously we have the league and in a cup final already and then a semi-final this Saturday against Hermes. The boys are very much focused and want to finish this 5 year run being undefeated in Aberdeen and that’s the sole focus just now. “To win the Scottish Cup in May would be the icing on the cake. There has been a lot of boys who have been on this journey for such a long time and to finish it off at 17s with a Scottish Cup win particularly after the experience we had last year being beat in the final by Rossvale then I think it’s very much unfinished business. “We need to go down there and do ourselves justice this year. If you can’t describe us as the best ever Albion team then you can describe us as the most consistent. To get to a Scottish Cup semi-final at 15s, the final at 16s and the final again at 17s then the boys deserve a huge amount of credit for that level of consistency because it’s hard. With a lot of the BUCS leagues coming to an end, Stirling Men’s 4th team were able to clinch the Scottish 5B league. We caught up with the coach, Chris Geddes, to find out the secrets to his team’s success. One of the biggest factors of the team’s success was the group of players and their work ethic. Chris said “This group of players have worked hard to repeat last year’s success. They work hard in every training session, take in what I am trying to show them and their attitudes are first class.” Not only do the boys work hard in training they all get along well and work together. He said “They realise is takes a team to be successful, so they have all bought into being a team this year and being like this now will help the boys in the future.” The boys work hard and are dedicated to their football which was crucial to them winning the league. Stirling were able to win the league last year and they just beat out Edinburgh College by 2 points. There was some friendly competition between the 2 teams and this was Stirling’s biggest challengers for the season. Chris commented “The biggest challengers for us this season were Edinburgh College after we narrowly beat them to win the league last season. Being able to beat them 5-0 this season at home this season was the biggest challenge we overcame.” Being able to beat their competition 5-0 must’ve gave them the confidence to push on and clinch the league. Chris said “As soon as we won by that score we were confident we could finish the season well and win the title. 8 wins and 2 defeats was a great season for our guys.” 8 wins and 2 losses is a great season and an accomplishment to be proud of. It takes a lot of teamwork and motivation to be able to win the league 2 years in a row and Stirling were able to maintain this title through eagerness to win. Chris said “We lost some guys from last season and got some new first year players who were hungry to win. They all heard the stories about last season and wanted to experience that for themselves. Also, they wanted any excuse for a good night out.” It sounds like the boys were determined to win the league for Stirling for the 2nd year running. Chris is proud of his team and what they have accomplished over the past 2 years. He said “They are all star players in my book but a special mention goes to our goalkeeper, John Allan. For the last 2 seasons, he has been first class, during last week’s loss that still won us the league, he was really ill but pulled himself out of bed and helped us secure the league for the 2nd year in a row.” It sounds like the teammates are all dedicated towards helping each other. What a way to go out, as back to back league winners. Maybe Stirling will be able to make it 3 years in a row. Aberdeen University Mens 2s Team were able to narrowly win the Scottish 4B league in the British University & College Sports (BUCS) competition. We spoke to the captain, Declan Adamson to find out how they were successful. Staying motivated and striving to find success can be a tough challenge for some teams and players but Aberdeen were able to find their motivation to win the league. Declan said “After a disappointing campaign in the 4B last season, we have been determined to gain promotion this season which has resulted in us winning 9 out of 10 games.” Aberdeen earned themselves twenty seven points this season, tied with Dundee & Angus who lost the league on goal difference. Being promoted to the 3A league means stronger competition for Aberdeen but they are taking it in their stride. Declan commented “Promotion to the 3A means that next season we will travel further afield in a national league and that means we have opportunities to test ourselves against stronger teams from all across Scotland.” This attitude has confidence written all over it for Aberdeen if they are to face tougher competition than they are used to, they need to remain positive. The most important game of the season was against Dundee & Angus College, and not only was it the most important game, it was the most memorable for Declan. He said “Without a doubt our 3-0 win against Dundee & Angus College. Having narrowly lost 2-1 away to D&A 1s earlier in the season they remained unbeaten.” D&A College and Aberdeen were neck and neck all season and this game was one to remember. “Anything but a win for us in what would’ve been the penultimate league game would’ve made it impossible to win the league. We spent the majority of the second half camped inside our own half but scored twice on the break to give us the crucial win which allowed us to win the league.” This game was crucial for Aberdeen to win and they came out on top in order to win the league. Although 2nd place isn’t anything to be ashamed about, Aberdeen finished 2nd in the same league last season and have used this as fuel to motivate them this season to finish 1st. Declan said “Last season’s disappointment definitely helped motivate us this season.” Not only did this motivation help them win the league, they also brought in some new players. “We had really fruitful trials at the beginning of the season and also brought in a few quality players from the 3rd team. The squad this season is stronger which allowed us to make that jump and reach 1st place.” The players are obviously motivated and the addition of new, fresh players gave them the boost they needed to gain promotion into the 3A league. The teamwork and chemistry was a huge factor in the success of Aberdeen Uni. Declan said “We don’t reply on any one player but are really strong as a group. Defensively we’ve been solid all season and that starts from the front.” It sounds like Aberdeen were strong all over the park and this was crucial to the team’s promotion. “Almost everyone has at least one goal to their name this season and we have a few players who are capable of scoring out of nothing.” Aberdeen seem very capable of outscoring their opponents and especially when it counts. Congratulations on Aberdeen University on winning the 4B and we wish them luck in the 3A league next season. James Young High School were the winners of the West Lothian Schools Football Association (WLSFA) Under 15 age group and we caught up with the coach Nevil Cunningham to find out the details of their success. Being winners of the WLSFA is a huge achievement for James Young HS although they also won last season. Nevil said “The team are absolutely delighted to have won again this season. They did feel a bit of pressure to retain the title but have done themselves and the school proud.” The players must be feeling a real sense of pride and accomplishment to have won the league for 2 consecutive seasons. The players will be walking with their heads held high at James Young Highschool. Nevil had many moments to be proud of throughout the season but he had 2 moments that stood out above the rest. “Our wing back, Ben, had a great hat-trick but a shout out has to go to our fantastic keeper Ryan, who has kept us in games so many times. He had several point-blank saves again in our last game against St Margarets.” Ryan and Ben were standout players this season but the great team effort and synergy helped them to get the points they needed to win the league for the 2nd time. Although they had success in winning the league they also came across some challenges during the season. Nevil commented “Early on in the season we played Deans Highschool who were probably our main rivals for the title this year. We managed to come out on top 4-3 after a very topsy-turvy game that could have went either way.” A close game between two of the top competitors in the WLSFA. It takes a lot of motivation and strive to win the league back-to-back and James Young HS have great chemistry that brings them together in order to win. Nevil said “We have a lot of boys who play together regularly at club level which helps with the cohesion of the team”. Playing football at a club level also helps with building up skills and experience of playing with a team and helps to create the necessary skills to compete. He also said “The boys are also good friends, this is one of the great things about school football as it allows them to play together as on the weekends they have outside commitments.” Playing football at club level means that the boys don’t always have time to play together as part of a team outside of school because they all play for different teams.